Every rider knows that the largest Motorcycle Rally in USA for the Cruiser motorcycles is the Sturgis Motorcycle Rally. This event has been happening since 1938, and more than half a million riders from across the globe are part of it. This year for the first time, Ducati was present there officially. The custom designed Ducati XDiavel by Roland Sands Design, was presented to the world. The machine made by RSD is nothing less than mesmerizing. Roland Sands has wrapped the XDiavel in shades of black and silver with crystals shining underneath the clear coat on the tank. The gold pin stripes on the tank run across from the seat to the handlebars, on either end. This belt driven Ducati XDiavel features RSD and Ducati logos at a lot of places like the bar-end weights, front and rear wheel hubs, fuel cap and the engine cover. The bike also has a custom seat on it. Roland Sands has also created a line of special accessories for the XDiavel and are available on the Ducati website and in the performance catalogue at the Ducati Dealers. 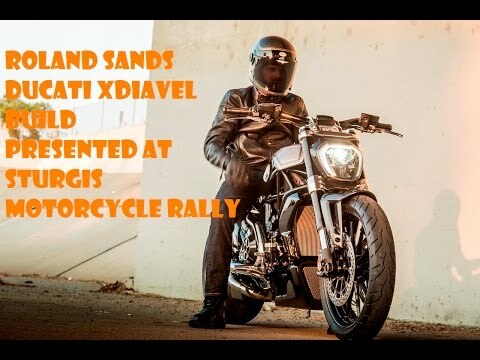 In Roland Sands words, “”The xdiavel is a beast. A wolf in wolves’ clothing and a serious piece of speed equipment. We really wanted to pivot off all that amazing technology and not mess it up by tearing it out. So the bike is still very stock from a functional standpoint. The bike was a 3-month build, with careful consideration and deliberation about the direction of the design. Ultimately, we decided to twist the aesthetic while retaining decidedly ‘stock’ bike functionality. I’m proud to say that’s exactly what we’ve achieved”. Imagine a 14 years old boy up in a performance race shop sweeping floors, at 24 years winning a 250cc Grand Prix and ultimately becoming a world known custom bike builder. This is the story of Roland Sands. He is an American motorcycle racer based in California. He designs rather redesigns the high performance motorcycles. RSD’s latest custom build is the Ducati XDiavel that was shown at the Sturgis Motorcycle Rally 2016. He has won awards for designs, and one of the firsts was from the very famous Chip Moose. In 2006, he founded his design company Roland Sands Design or RSD. Ducati XDiavel is an incredible motorcycle that is equipped with the L-twin 1262cc engine. The bike delivers a whopping 156 horses and 128.9 Nm of torque. The XDiavel is equipped with a lot of Technology like Ride-by-Wire or RBW, Slipper clutch, a 3.5inch color TFT instrument cluster, backlit switches, Cruise control, Ducati Power launch and the list goes on. This machine gets the letter X before the name Diavel as Ducati considers it to be a crossover of two worlds. One bike which gives you the best of cruiser and very high performance with the signature Italian styling by Ducati engineers. We would like to see it to believe it so here is the Ducati XDiavel by Roland Sands.